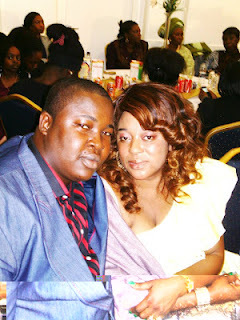 STAR ACTOR BABA TEE & LONDON BIG GAL, YETUNDE ODUWOLE’S LOVE BLOSSOMS. That popular Yoruba comedian, Baba Tee ( Babatunde Bernards) loves his London based wife, Yetunde Oduwole is no longer news. Practically all of Yetunde’s friends know that the Olabisi Onabanjo University graduate is madly in love with Yetunde. And that is pretty obvious from the way he spoils her silly with love and affection. Since Yetunde got hooked to Baba Tee early this year, she has been enjoying life to the hilt. The couple have become the hottest celebrity couple in the showbiz world. They have been spotted at different places and events both in Lagos and London. Those in the know revealed that the bond between them is so strong that they can hardly stay apart from each other. They work, play and also invest in businesses together. Despite the rumour making rounds the town that Yetunde is presently undergoing some changes on vital parts of her body, an indication that she is pregnant; she has refused to affirm or deny the speculations. It would be recalled that Yetunde and Baba Tee met in December 2011 when the comedian travelled to UK for the Afro Hollywood Awards. They kicked started a relationship and ever since, their affection for each other grew stronger. Yetunde who was once married to celebrity journalist, Babs Adegbenjo, has 2 kids and is about 10 years older than Baba Tee. With their public display of affections, one can easily conclude that their love is indeed made in heaven and they love are enjoying marital bliss.